It’s that time of year again, starting to round-up this year’s best dressed, celebrity style, fashion moments (post coming up!) and right now the round-up of the best celebrity weddings of 2013. 2013 has been a funny year for weddings, wedding planners and suppliers all predicted that business would be down due to the infamous ‘number 13.’ This could explain the huge celebrity weddings we had in 2012 of some well-known celebrities such as Blake Lively, Rochelle Wiseman, Anne Hathaway and Jessica Biel. As last year, the trend for intimate or even secret weddings continues but some have gone for the full on lavish wedding such as Amir Khan and Faryal Makhdoom. Actress Christina Ricci married her long-term camera technician boyfriend James Heerdegan in October, at Harold Pratt House in New York. The couple announced their engagement in February, so just over six months was enough time to have a gorgeous bespoke Givenchy gown made. With Chantilly lace applique, embroidered pearls and satin piping in white silk tulle, this dress is stunning. It seems like an elegant round neckline was an emerging trend for wedding dresses this year, Millie Mackintosh looked chic in her vintage dress by Alice Temperley. The Made in Chelsea star married the rapper known as Professor Green at Babington House in September. The fairy-tale wedding had around 120 guests including 2012 bride Lily Allen, and Made in Chelsea co-stars, Caggie Dunlop and Rosie Fortescue. Kiera Knightley added a quirky edge to her ‘something old’ by wearing a dress she had already worn before in 2008 to a BAFTA party. It was Chanel by Rodarte, for a low-key wedding in the South of France where she married her musician boyfriend James Righton, with just eleven guests. Kiera Knightley kept her ensemble simple with Chanel ballet pumps and a signature bouclé jacket. 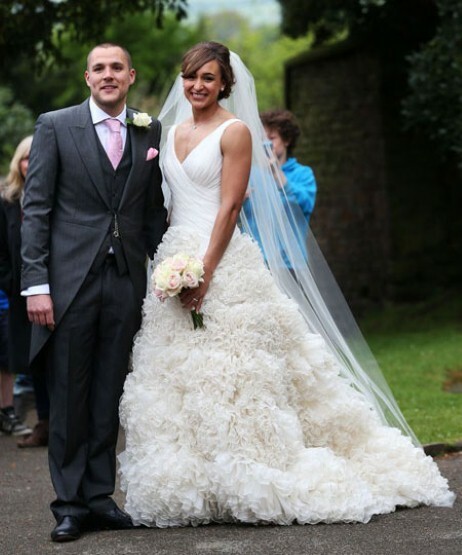 Olympic champion, Jessica Ennis married her childhood sweetheart Andy Hill back in May. They had a classic ceremony at St Michael and All Angel’s Church and the bride wore Monique Lhuillier gown with a stunning ruffle skirt. Dreams of becoming a princess do come true for some and it certainly did for model Kendra Spears. She became Princess Salwa Aga Khan when she married Prince Rahim Aga Khan, she wore a traditional looking gold and cream Manav Gangwani Couture sari. The couple married on the banks of Lake Geneva, Switzerland. Amir Khan and his gorgeous fiance, Faryal Makhdoom had a lavish wedding at the Waldorf Astoria in Manhanttan, New York. They held a second event in Amir Khan’s hometown, Bolton with themed nights in between including a mehndi night. The couple are now expecting their first child. Another couple soon to be parents are Theo Wallcott and Melanie Slade, they married after nine years of dating. Melanie Slade wore an exquisite Suzanne Neville wedding gown for the wedding which took place at an Medieval Castle in Italy. Halle Berry and Oliver Martinez had a secret and intimate wedding with 60 guests, at the Chataeu des Conde in France. Halle was pregnant at the time with Maceo and wore a simple ivory gown. The singer, Kelly Clarkson married in a lace Temperley dress. She is now also set to be a mummy in 2014! After an extremely busy 2012, another Olympic star, Victoria Pendleton married at Colshaw Hill. Staying true to her roots, she chose to wear a gorgeous dress by British designer Suzanne Neville. Kate Bosworth and Michael Polish had their rustic inspired wedding on top of a mountain at The Ranch at Rock Creek over a four-day celebration for their guests. Kate wore an elegant Oscar De La Renta dress and the full affair was assisted by the well-known Martha Stewart Weddings.